Here is some evidence that the Expo Line may be working. One study finds that after the light-railed opened, Angelenos who lived within a half-mile of a station tripled their ridership and reduced their daily driving by 40% (see study below). I had a second experience. I parked in Culver City and took a relative to a show at the Los Angeles Convention Center. On the way, my relative declared that he does not take public transit and prefers to drive. However, as a Laker fan, I have learned he now regularly parks in Culver City and takes the light rail to the Staples Center. He even continued to do so after he once boarded the Blue Line on the way home by mistake. At this point, most people I know use the light rail to ride and park in Culver City and take the Expo to the Staples Center. 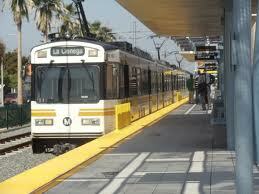 Residents living near Expo Line stations reduce car use, study shows.